y magazine. Covering popular and important city and world affairs, as well as offering opinion on arts, politics, and literary topics. Witty cartoons add a touch of humor and have become a reader-favorite in every issue. Following current events and happenings within New York City and offering a look at important world affairs, The New Yorker boasts a range of thought-provoking essays, opinion columns, reviews, poetry, cartoons and commentary that will pique your interest and keep you coming back for more. You’ll easily get your fix for everything from literary and style commentary to opinions on politics and world affairs. 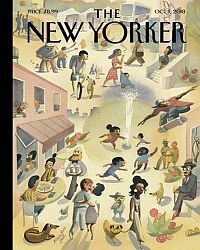 The New Yorker publishes several special issues and editions throughout the year that give you the low-down on books, important cultural events in New York City, and evens with a broader scope, such as The Academy Awards. Anyone who enjoys well-written and thought-provoking articles and commentary about politics, the arts, world affairs and more will enjoy a subscription to The New Yorker!